It’s positively Faulknerian (but more accessible). “Way Downriver,” Edward Morgan’s adaptation of the novella, “Old Man,” by Nobel Prize-winner William Faulkner, has many familiar Faulkner elements: set in his home state of Mississippi (one of his works not set in fictional Yoknapatawpha County); focusing on human tragedy tinged with irony and sly humor; filled with Biblical references; and touching on issues of race, the hypocrisy of bureaucracy and the plight of Man against the forces of Nature. And, oh yes, a boatload of beautiful, lyrical descriptive language. The play debuted in 2014 at the Alabama Shakespeare Festival, developed in association with the Southern Writers Project, and premiering under the title “Twenty-Seven.” Morgan, who was present at the local opening and had been at rehearsals for the week leading up to the West coast premiere at North Coast Repertory Theatre (the play’s second production), said he changed the name of the piece because most people didn’t seem to connect “Twenty-Seven” with the year the dramatic action takes place. Faulkner’s “Old Man” refers to the Mississippi River (just like the 1927 Jerome Kern/Oscar Hammerstein song, “Ol’ Man River” from the musical, “Showboat”). It was as good as a character in Faulkner’s original, so crucial was it to the story. 1927 was the year of the Great Mississippi Flood, still on record as the most destructive river flood in U.S. history. 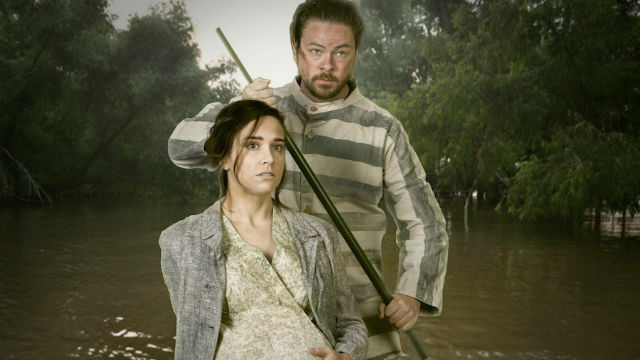 Thanks to a magnificent production at North Coast Rep, we feel the terror of the flooding, and the spine-chilling journey of two mismatched people in a small boat, battling the violent elements. Morgan, a playwright, adapter and director, has fleshed out the story, adding dialogue where there was little or none, as well as a racial element and a romance — and names for the characters, who remained nameless in “Old Man,” part of a novel called “If I Forget Thee Jerusalem” (published in 1939 as “The Wild Palms”), comprising a pair of intertwined novellas. Aikins is serving a 15-year term in Parchman Farm, the maximum security Mississippi State Penitentiary, for an attempted train robbery inspired by dime novels he’d read in his youth. Two men wound up dead, though not by his hand. When the rains start and the river begins to rise, prisoners from Parchman are sent out to help in the rescue effort. The introspective, taciturn Aikins (Richard Baird) is teamed up with young, verbose and inquisitive Tommy (Benjamin Cole). Their mission is to pick up a stranded woman and man. They never got to the man; the boat capsized, and the two convicts were separated. Tommy clung to a tree, and Aikins was given up for dead. But nine weeks later, he shows up back at the Farm, and he’s recounting his entire adventure, battling the river with the marooned woman, who happened to be eight months pregnant. It’s a terrific adventure, as written and as directed by North Coast Rep artistic director David Ellenstein. Morgan created another prisoner, Ike (Robert Grossman) who offers an older man’s cynical perspective on life and its disappointments. He also provides musical accompaniment to the proceedings: luscious, bluesy guitar picking that often underscores Aikins’ descriptions (sounding like rushing water at times, for example). The playwright heaps on a horde of colorful characters encountered by Aikins and the stalwart Ellie (New York-based Sara Fetgatter), all played with gusto, humor, skill and credibility by John Herzog and the impressively varying Max Macke and Geno Carr (who does a mean, French-speaking Cajun who gives a superb mime of an alligator-wrestling escapade). Even the smallest of characters is given dimensionality, so they veer away from caricature. Morgan ingeniously interlaces Aikins’ narration with his river encounters and the peanut-gallery exclamations of the other two prisoners, still in their cell. Once or twice, Ellie gets a moment in the spotlight for one of Faulkner’s evocative accounts of her harrowing exploits, excellently delivered by Fetgatter. The stage is divided into three parts (set design by Marty Burnett): the prison cell stage left, the warden’s office stage right, and at center, a sandbagged breakaway stone wall with an open space for projections (Aaron Rumley), strikingly depicting the river at its wildest and its calmest, crowned by furious clouds or romantically illuminated by moonlight. The soundscape (Melani Chen) is wonderful (thunder, rain, crickets, etc.) and the lighting (Matt Novotny) also enhances the experience. But the centerpiece of this engaging, engrossing show is the superlative, gut-wrenching performance of Richard Baird, who creates a stalwart man of conscience brought down by his sense of what’s right. We’re completely swept along in the drama, holding our collective breath at times, or raging at the unfairness of it all. This is a coup and a triumph for North Coast Rep, a superbly energized and nuanced production of a new work that begs to be seen.